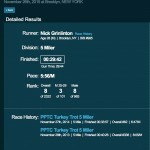 For the past three years on Thanksgiving my wife and I have participated in Prospect Park Track Club’s 5-mile Turkey Trot. When the registration opened a few months earlier, we made sure we signed up on that day before it sold out (some 2,000+ runners run this race). While most of my preparations have been geared towards marathon running, I really enjoy these smaller races to see where I’m at in my running. This year’s trot was no exception, especially after improving quite nicely this year. I mainly wanted to see what I could do in my hard efforts. 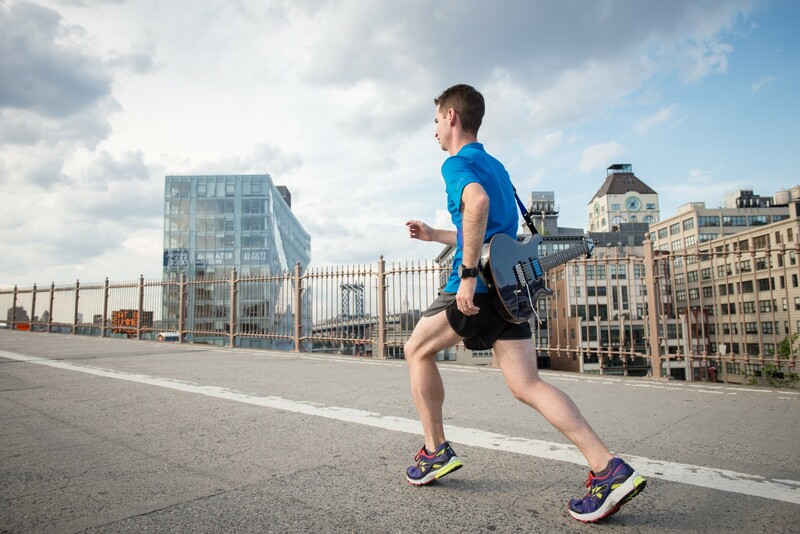 This gives me more insight into training properly for The Colorado Marathon next year. I set a goal of completing the race in 30 minutes or under. I made sure to stand in front of the field so I could pace properly throughout. Once the race began I exercised patience. I settled around a 6:04 mile for the first 3 miles, then decided to take off. I was really familiar with the course and knew I could run in around the upper 5:00’s without crashing. 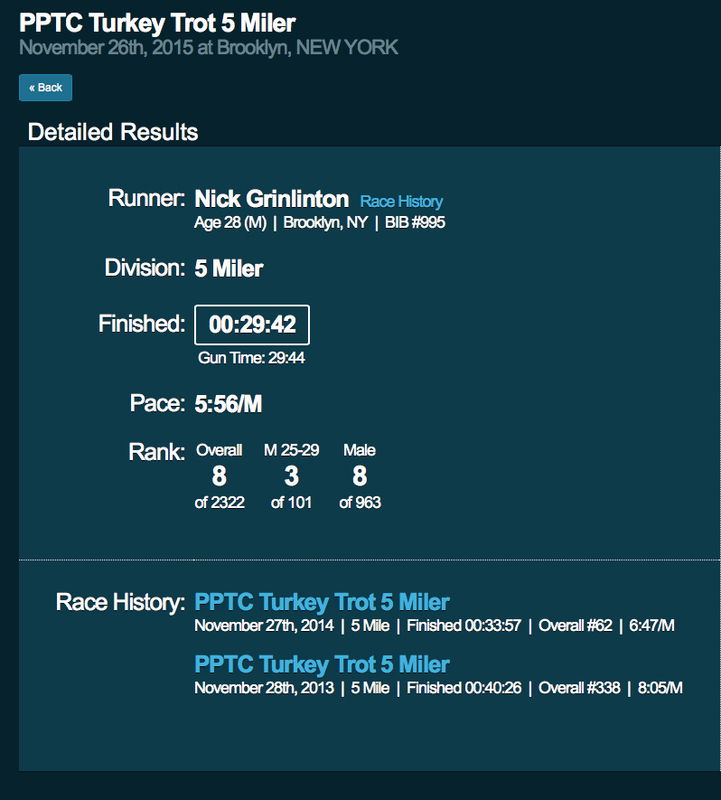 Around mile 4, I found that I was in 9th place. Having never placed so high, I had the confidence to keep pushing towards the finish line. I think I’ll always remember the adrenaline towards the end. Around the last two miles I began to catch up with the runner in front of me, but I didn’t go right away. I knew I would be able to pass him, but didn’t want to waste my energy until the very end. Once I saw the finish line I kicked and went around him to finish in 8th place. I’m not sure how fast I sprinted. All I heard was cheers from the spectators towards the end. I crossed the finish line at 29:42. That’s a 5:56 per mile average. Not only did I finish 8th, but I beat my goal of finishing in 30 minutes. It’s really important to set specific goals and to have a plan for carrying them out. I knew to finish with that time I couldn’t go fast right away or I would be tired. I needed to strategically plan how to run the 5 miles to my current ability while going with the flow of the race. I’ve come such a far way from my first trot in 2013. I’m looking forward to racing it again next year. Though I won’t know what I’m capable of until next fall, I hope to eventually race it around a 5:00 mile. Until then I’m looking forward to starting the next phase of my training. A video of my finish.